Intrigued much? This ancient secret has been used for centuries by the Japanese, Chinese and Southeastern Asian women. The Yao minority women from Huangluo village, in Guangxi province in Southern China are known to have extraordinarily long hair that stays black until they are around 80 years old. They believe that having long hair is an auspicious sign of good health, good fortune and longevity. The average hair length of the women is about 6 feet and the Yao women even hold the Guinness Book of record award as the ‘world’s longest hair village’ (Issa real something…). The secret has also been used by imperial princesses in the East also. This secret is also great for the skin. It helps to heal scars and reduce wrinkles, fine lines and inflammation leaving the skin with a healthy glow. I am sure that right now you are like what is the secret? Well, for most Africans and Asians I am sure you have it in your kitchen and you never thought of it in this way. What is this secret? It is RICE WATER!! Yes, Rice Water!! The water we get when we wash your rice or boil it. I know right! I was like What? Rice?! Rice ke?! That we eat every week? That I have probably thrown away a tanker full in my lifetime? Okay o. Here is the science behind the use of rice water for hair. According to the research, rice contains antioxidants, minerals, vitamin e and traces of ‘Pitera’ (albeit majorly the unpolished, organic type contains more of these than the polished ones). The fermented rice water which is good for the hair contains ‘Inositol’ which helps to increase the hair’s elasticity thereby making the hair strands flexible and defining the hair curls. It also helps to decrease surface tension thereby smoothen the surface of the hair so that the hair strands glide on each other which leads to less friction between the hair and also less knots and tangles. It also help to make the hair to shine. The rice water helps in hair growth and acts as a strengthening aid. 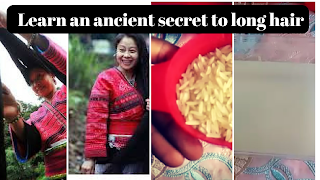 One great thing about rice water is that the molecules of inositol still attaches to the hair strands eve after it has been rinsed off so that it still continue to works and you supposedly observe improvement after the first rinse. The rice water is also used to wash/rinse the face as a face rinse and also used as a toner and a makeup refreshing spray. It helps to tone the face, minimise the pores and helps to heal scars. It is simple. There are two ways. One method involves getting an appropriate amount of rice (it doesn’t have to be so much …..e.g ¼ – ½ cup of rice) and rinse with water once (to remove dirt). Then wash the rice with water (make sure the water covers the rice…..like 6 folds) and then decant the water into another container with a lid. Place in a cool, dry and dark place for 24 -48 hours to ferment. You would know when it is fermented when it tastes sour or smells funky. You can boil it afterwards to stop the fermentation process if you plan on storing it for a week in the fridge. Another method is to place the rice and water in a pot (after rinsing once to remove the dirt) and boil for about 10-15 minutes. Decant the water into a container and allow it to cool. Simply wash and condition your hair then rinse your hair with the rice water and allow to stay on your hair for 15 -30 minutes (watch the video below for more information). Then rinse off with water. Continue with moisturising and sealing of your hair. To be able to see an improvement, you need to carry out this hair rinse weekly consistently. 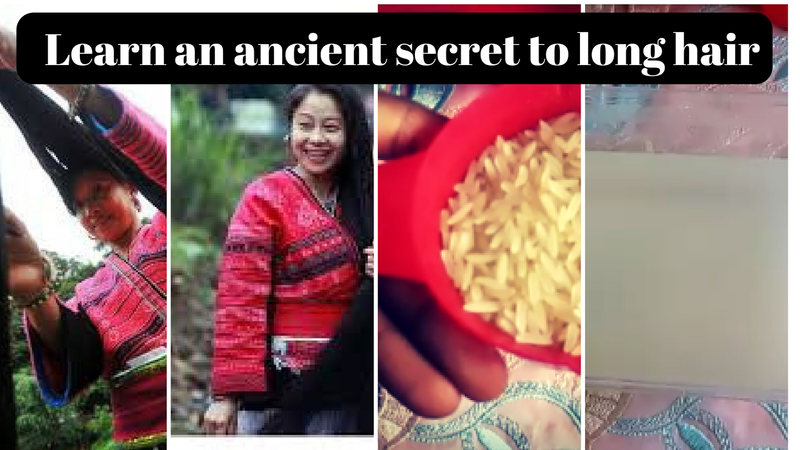 Also the Yao women also have unique genetics and diet so you might not achieve 6 feet length of hair growth but you would definitely see a major difference as seen in different women who have started using this remedy consistently. That is all for now. I hope you enjoyed this post and are intrigued enough to try this unconventional hair rinse. Remember that you have to be consistent with it and your daily hair regimen to achieve great results. Thanks for stopping by. Please remember to subscribe to my youtube channel (Petite Diva).